The stereotype of people travelling long distances in Australian cities is wrong but persistent. The reality is that most trips are relatively close to home. 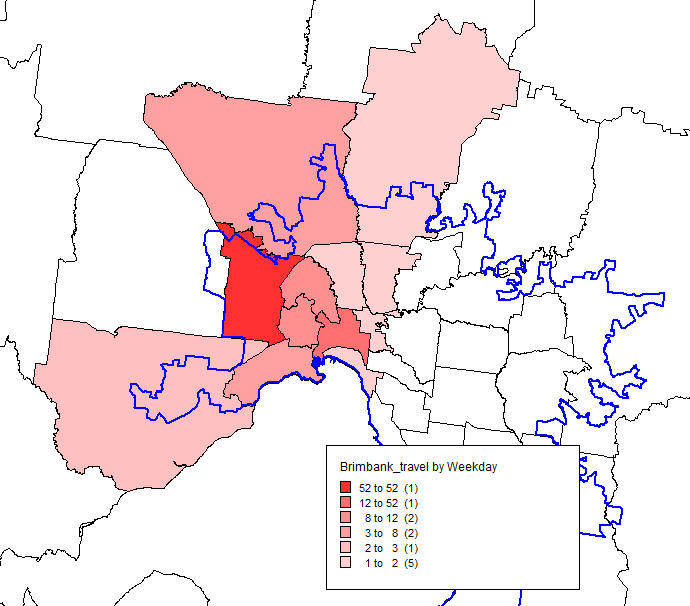 For example, the accompanying chart and map show that 52% of all weekday trips (all purposes, all modes) by residents of the middle suburban municipality of Brimbank in Melbourne’s west are made within the municipality. Further, 79% of trips are made either within Brimbank or to contiguous municipalities. 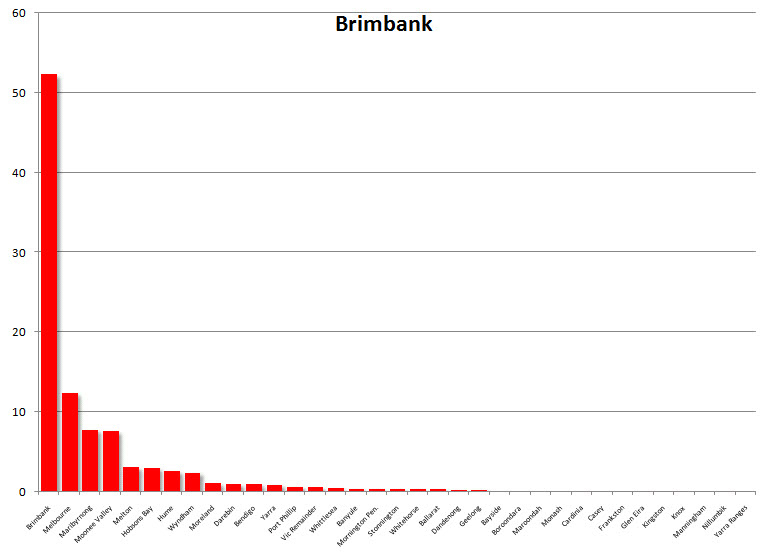 In fact more than 90% of trips by Brimbank residents can be accounted for if just one more destination – the city centre – is added to the list above. This pattern also holds for the other parts of Melbourne. More than 80% of trips by residents of Monash, Cardinia and Casey, for example, are likewise made within their home municipality or to neighbouring ones. While another 8% of trips by Monash residents are to the city centre, the corresponding figure is less for far-flung municipalities – just 4% for Casey and less than 1% for Cardinia (see more charts below). It thus makes sense to think of a city like Melbourne as a number of regions rather than as a very big, singular entity. In terms of what people physically do within the urban area, there are multiple ‘Melbournes’. Each little ‘Melbourne’ or region is centred on a home LGA and has a limited ‘home range’. 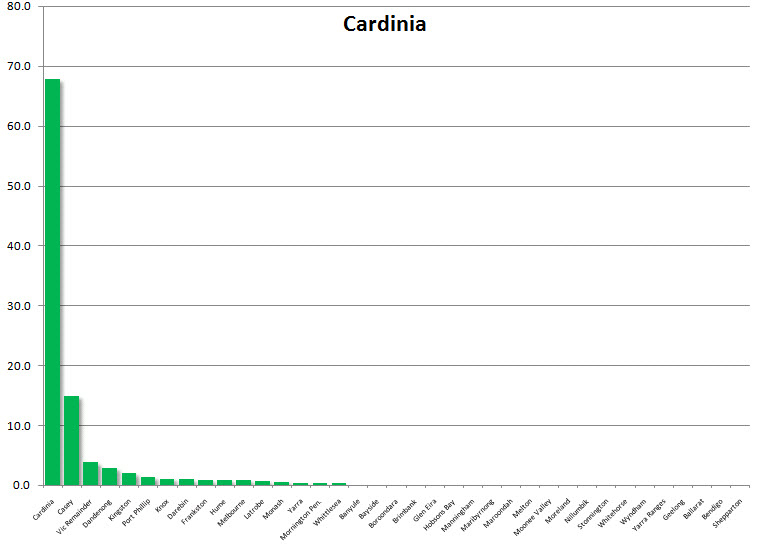 The median weekday trip distance (all purposes, all modes) for residents of Cardinia is 3.7 km. Monash is 4.9 km and Brimbank is 6.3 km. For the great bulk of residents, metropolitan Melbourne is more of a construct – an idea – than something that has a real presence in their day-to-day lives. With the exception of the city centre, few people venture much beyond their own region. This limited ‘home range’ is a product of many forces. In the case of the inner city municipalities – Melbourne, Yarra and Port Phillip – the predominance of professional jobs and social attractions in the city centre is an obvious and powerful factor. 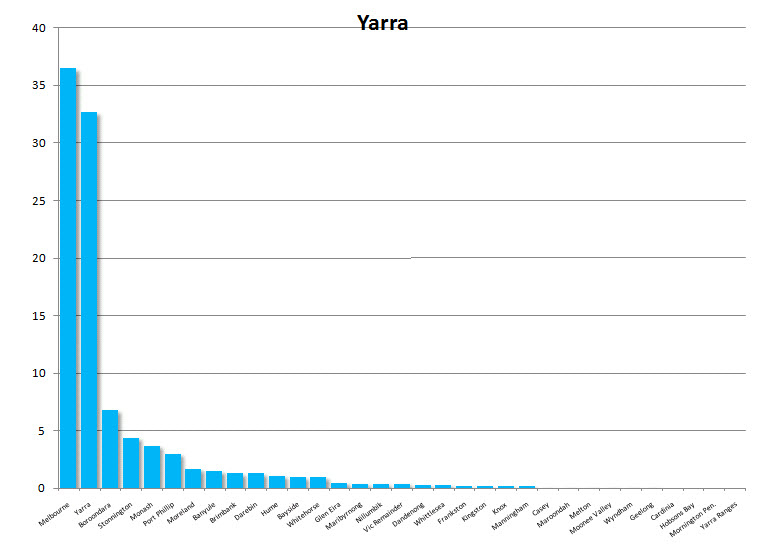 The median weekday trip distance for residents of Yarra is 2.8 km. For the great bulk of the population who live in the suburbs, the factors explaining this limited geography would include the suburbanisation of jobs (more than 80% of jobs in metropolitan Melbourne are outside the CBD), slower travel speeds on roads due to increasing traffic and the desire to live close to family and friends. It’s natural therefore to emphasise the importance of regions and devise typologies like The Age uses in its real estate pages e.g. inner east, outer east. But that assumes a community of interest at the regional level. And it assumes it can be defined within fixed boundaries. There are 31 municipalities in metropolitan Melbourne and they each display a localised pattern like the ones mentioned above. There are, in other words, 31 unique and overlapping ‘regions’. Even contiguous municipalities have very different aggregate ‘home ranges’. Consider, for example, the adjoining outer suburban municipalities of Cardinia and Casey. Just over 86% of weekday trips by Cardinia residents are made within the municipality itself; to neighbouring Casey; or to locations beyond the metropolitan area. 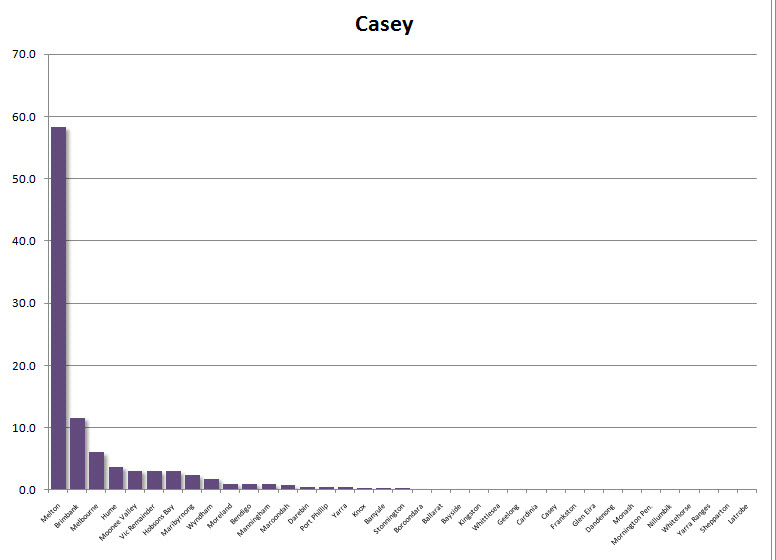 Casey however is quite different. 86% of trips by its residents are to Gt Dandenong, Monash, Melbourne, Kingston, Cardinia and, of course, within Casey itself. 31 regions is of course too many to be useful in most government programs and the idea that they are not exclusive – i.e. they overlap – would make any administrator tear his or her hair out. Nevertheless, understanding travel patterns should give those who rely on fixed regional definitions some pause for thought about the limitations of their frameworks. There is scope to use travel data to improve the functionality of regional definitions. The bigger issue is that localised travel has major implications for how these trips might be made. Short trips make public transport less competitive, partly because they tend to be dispersed and partly because waiting time becomes a larger proportion of total journey time. They promote travel by car because of its ‘on demand’ convenience, but also favour walking, cycling and travel by scooters and motor bikes. 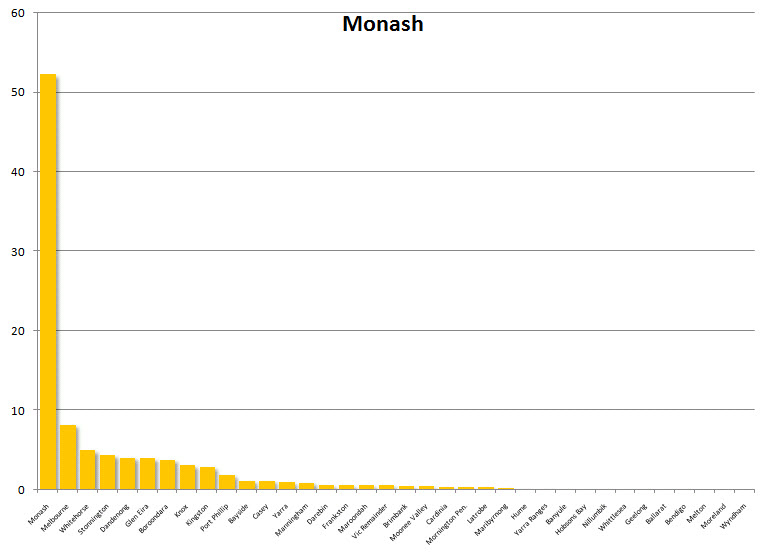 Below: what other municipalities do residents of Monash, Yarra, Cardinia and Casey municipalities travel to (percent)? Note: travel data is from VISTA.